Maine bear hunters are getting back to the woods, and back into their comfort zones, after spending months in the political arena last year. "It's nice to have a period of time off of the political wrangling," said David Trahan, Executive Director of the Sportsman's Alliance of Maine. "I think it's a big sigh of relief for a lot of people." 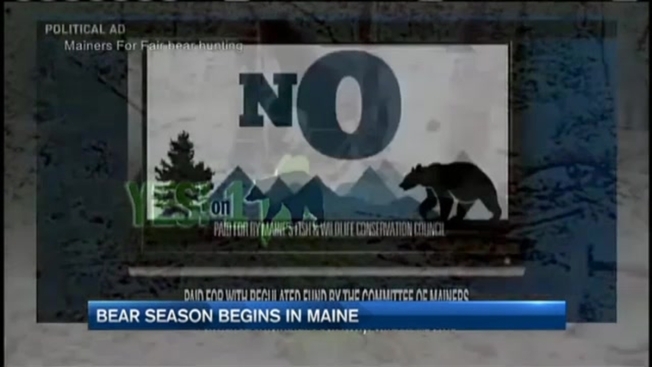 Last fall, a referendum question to ban certain bear hunting tactics divided Maine voters. The Humane Society of the United States led a campaign to ban bear baiting, hounding, and trapping. "Hunting is a tradition in Maine, but cruelty is not," said Katie Hansberry, Maine State Director of the Humane Society of the United States. The vote was extremely close, but ultimately the referendum was defeated. "It was a very close vote, and we're going to continue to work on this issue," said Hansberry. While her organization does not intend to initiate another ballot question in the near future, Hansberry said they will keep working to change the hunting rules, focusing on the trapping and hounding. "Those are particularly cruel and egregious practices," she said. Bear biologists at the Department of Inland Fisheries and Wildlife said these controversial practices are critical to maintaining a healthy bear population. "We really couldn't do it without these hunting techniques we have now," said Biologist Randy Cross. The IFW reports that 96 percent of bears harvested in 2013 were taken by bait, hounds, or traps. Cross said changes to the rules will cause the bear population to grow uncontrollably. "It would be very concerning," he said. But Hansberry said the population is growing under the current practices. The IFW estimates that the bear population has grown from 31,000 in 2010 to 35,000 today. "It's completely inconsistent to say 'Do not feed the bears,' yet allow for the bears to bed on a grand scale, with millions of pounds of junk food," said Hansberry. More than 11,000 permits are expected to be sold to hunt bears in Maine this year. Biologists say hunters may see fewer bears this year. An abundance of natural food should keep bears foraging later into the season, making them less likely to respond to bait.